Khanh Hoa (VNS/VNA) - Fifty-seven-year-old Nguyen Thi Hau has been pole-shouldering salt for more than half of her lifetime. She has never thought of quitting, but the poor crop of salt this year has discouraged her a bit. “I’ve worked as a leader of a salt-carrying team for more than 30 years, witnessing all the ups and downs of the career. Producing salt does not make us rich but at least brings us a stable daily income of 150,000 VND (7 USD). However, in recent years, dropping prices of salt made the income only enough to buy rice and dried fishes,” said Hau, a salt farmer in Ninh Diem commune in the central coastal province of Khanh Hoa. Hau is among 2,000 farmers from more than 500 families in the commune who are struggling with the poor crop of 2017. According to the local group Salt Co-operative 1-5, last year’s harvest was good because of the prolonged hot weather. However, unstable consumption led to a drop in price to only 400,000 to 450,000 VND (19-22 USD) per tonne. This year, the price has risen up to 600,000 to 700,000 VND (25-30 USD) per tonne due to the lean harvest as unusual and continuous rains have flooded salt fields. To harvest salt, farmers have to pump fresh water out of fields, which is a costly process. After two consecutive years of falling price, when the salt price reached its peak this year, farmers faced a poor crop. Farmer Tran Van Minh from Ninh Thuy commune’s Dong Ha ward, wondered whether he should give up. “We cannot make ends meet. My family has invested 19 million VND (about 800 USD) in water-pumping out of a three-hectare salt field which brings us an income of 21 million VND (900 USD) in two months. Four farmers working continuously can only earn 2 million VND (nearly 100 USD) during that two months. We will feel remorse if we quit, like the others,” he said. Meanwhile, salt farmers in Tinh Gia and Hau Loc districts in the central province of Thanh Hoa, are also worrying about their tradition of producing salt. Many breadwinners are seeking new jobs in cities, leaving salt fields for children or old people. “When talking about salt making, we talk about the most vulnerable farmers, facing the lowest prices but hardest working conditions. We depend heavily to the weather and the market,” said farmer Nguyen Thi Vi of Hau Loc district’s Hoa Loc commune. There are 300 ha of salt fields in Thanh Hoa province, accounting for 10 percent of the farming land of salt-producing communes. “In the old days, three kilos of salt could exchange for one kilo of rice. Now, even ten kilos of salt cannot buy a kilo of rice,” said Tran Van Ngan of Hoa Loc commune. According to him, several salt farmers want to maintain their traditional expertise. However, they cannot survive with the income from selling salt. Seeing the situation of salt farmers, local enterprises have offered help. Khanh Hoa province has 1,000 ha of salt fields, mostly in the communes of Ninh Diem, Ninh Hai and Ninh Thuy, as well as in Hon Khoi village. The two main local purchasing enterprises of Hon Khoi salt field are Hon Khoi Salt Export Company and Salt Co-operative 1-5. “The co-operative guarantees it will purchase all salt produced by local farmers. However, this year’s output of the field is only about three tonnes. We also support them by lending money for upgrading and renovating salt fields or water pump systems. At the end of the day, all existing solutions are just temporary,” said Truong Cong Hieu, Director of Salt Co-operative 1-5. 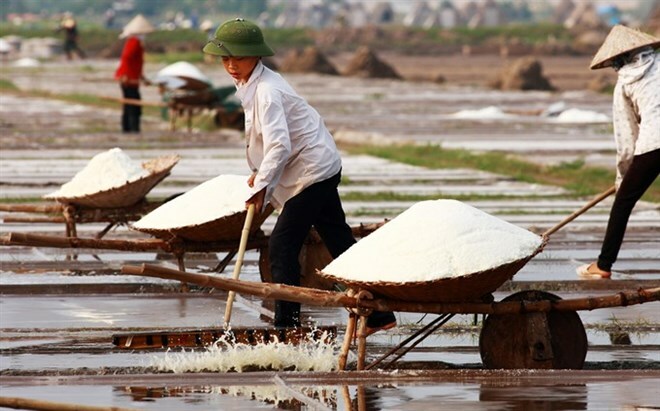 To maintain the brand of “Hon Khoi salt” and assist salt farmers through deflation period, Khanh Hoa province’s People’s Committee issued the Decision No 661/QĐ-UBND on the assistance of agricultural produces and rural services in the period of 2017-2020 in March. The policy says that co-operatives, enterprises and salt farmers will be supported with a loan of up to 50 million VND per hectare with the support of 100 percent of interest rate in two years, maximum 50 million VND (2,200 USD) per hectare of salt field. Until 2018, the committee will reconstruct the Hon Khoi salt field and upgrade the water pumping system. Additionally, policy makers are considering different vocations for salt farmers. However, in reality, farmers can only rely on themselves.